Your day-by-day itinerary now includes UNOG - Palais des Nations as well as Bains des Paquis. On the 26th (Fri), get a sense of history and politics at UNOG - Palais des Nations, then enjoy the sand and surf at Bains des Paquis, then ponder the design of The Geneva Water Fountain, and finally see the interesting displays at Patek Philippe Museum. Get ready for a full day of sightseeing on the next day: contemplate the waterfront views at Lake Geneva. To see maps, more things to do, photos, and other tourist information, read our Geneva custom trip planner. London, UK to Geneva is an approximately 4.5-hour combination of train and flight. You can also take a train; or do a combination of car and train. The time zone difference when traveling from London to Geneva is 1 hour. While traveling from London, expect a bit warmer days and about the same nights in Geneva, ranging from highs of 30°C to lows of 16°C. Finish up your sightseeing early on the 27th (Sat) so you can travel to Annecy. The canals is in Annecy helped earn the medieval town the nickname the Venice of the Alps. Get in touch with nature at Lac d'Annecy and Le Semnoz. Cite medievale and Cathedrale Saint-Pierre will appeal to history buffs. There's much more to do: look for all kinds of wild species at Gorges du Fier, tour the pleasant surroundings at Parc Charles Bosson, make a trip to Pont des Amours, and take your sightseeing to a higher altitude at La Tournette. To find photos, more things to do, maps, and tourist information, you can read our Annecy custom trip planner. 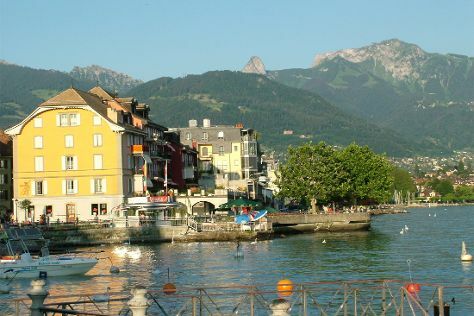 Explore your travel options from Geneva to Annecy with the Route module. In August in Annecy, expect temperatures between 29°C during the day and 16°C at night. Finish your sightseeing early on the 31st (Wed) so you can travel to Talloires. Talloires is a former commune in the Haute-Savoie department in the Auvergne-Rhône-Alpes region in south-eastern France. On the 1st (Thu), identify plant and animal life at Reserve Naturelle du Bout du Lac, then kick back and relax at Plage Municipale de Menthon Saint Bernard, and then step into the grandiose world of Chateau de Menthon-Saint-Bernard. To see reviews, other places to visit, ratings, and other tourist information, refer to the Talloires itinerary planner. Use the Route module to find suitable travel options from Annecy to Talloires. In September, daytime highs in Talloires are 25°C, while nighttime lows are 13°C. Finish your sightseeing early on the 1st (Thu) to allow enough time to travel back home.